Merlin is a wizard featured prominently in Arthurian legends. 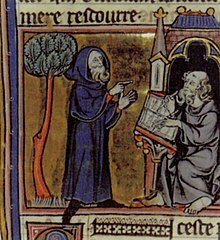 Depictions of the character began with Merlin Ambrosius in Geoffrey of Monmouth's Historia Regum Britanniae (c. 1136), based on an amalgamation of previous historical and legendary figures, such as the North Brythonic prophet Myrddin Wyllt, and the Romano-British war leader Ambrosius Aurelianus. No one's ever needed to do it, as much as you do. This is your moment. Believe in yourself. To Arthur, in Camelot (2011), The Sword and the Crown. What exactly do you think I'm capable of? To Arthur, in Camelot (2011), Three Journeys. Camelot isn't built on magic, but on people, on their faith. To Arthur, in Camelot (2011), The Battle of Bardon Pass. I have walked my way since the beginning of time. Sometimes I give, sometimes I take, it is mine to know which and when! Behold! The Sword of Power! Excalibur! Forged when the world was young, and bird and beast and flower were one with man, and death was but a dream! Excalibur (1981), written by Rospo Pallenberg and John Boorman. You will be the land, and the land will be you. If you fail, the land will perish; as you thrive, the land will blossom. Anál nathrach, orth’ bháis’s bethad, do chél dénmha. "The Charm of Making", an incantation repeatedly uttered by both Merlin and Morgana, is in an Old Gaelic dialect which translates to: "Serpent's breath, charm of death and life, thy omen of making." Look upon this moment. Savor it! Rejoice with great gladness! Great gladness! Remember it always, for you are joined by it. You are One, under the stars. Remember it well, then... this night, this great victory. So that in the years ahead, you can say, "I was there that night, with Arthur, the King!" For it is the doom of men that they forget. Spoken following the decisive British victory over the Saxons at the Battle of Badon, in Excalibur (1981), written by Rospo Pallenberg and John Boorman. The days of our kind are numberèd. The one God comes to drive out the many gods. The spirits of wood and stream grow silent. It's the way of things. Yes... it's a time for men, and their ways. Remember, there's always something cleverer than yourself. When a man lies, he murders some part of the world. I know whom thou seekest, for thou seekest Merlin; therefore seek no farther, for I am he. Le Morte d'Arthur (c. 1469) by Thomas Malory, Book I, ch. 1. I've never studied magic or been taught. … I was born like this. Merlin (TV Series), The Dragon's Call [1.1], written by Julian Jones. Do you know how it feels, to be a monster? To be afraid of who you are? Merlin (TV Series), The Lady of the Lake [2.9], written by Julian Jones. "Merlin and the Gleam" (1889) by Alfred, Lord Tennyson, st. 1. "The best thing for being sad … is to learn something. That is the only thing that never fails. You may grow old and trembling in your anatomies, you may lie awake in the middle of the night listening to the disorder of your veins, you may miss your only love, you may see the world around you devastated by evil lunatics, or know your honour trampled in the sewers of baser minds. There is only one thing for it then — to learn. Learn why the world wags and what wags it. That is the only thing the mind can never exhaust, never alienate, never be tortured by, never fear or distrust, and never dream of regretting." The Once and Future King (1938 - 1958) by T. H. White, The Sword in the Stone (1938). There was just such a man when I was young — an Austrian who invented a new way of life and convinced himself that he was the chap to make it work. He tried to impose his reformation by the sword, and plunged the civilized world into misery and chaos. But the thing which this fellow had overlooked, my friend, was that he had had a predecessor in the reformation business, called Jesus Christ. Perhaps we may assume that Jesus knew as much as the Austrian did about saving people. But the odd thing is that Jesus did not turn the disciples into storm troopers, burn down the Temple at Jerusalem, and fix the blame on Pontius Pilate. On the contrary, he made it clear that the business of the philosopher was to make ideas available, and not to impose them on people. Responding to Sir Kay's suggestion that if a King found "human beings were too wicked or too stupid to accept his way, he might have to force it on them, in their own interests by the sword", in The Once and Future King (1938 - 1958) by T. H. White, The Queen of Air and Darkness (1939), Ch. 8. Man will fly someday, I tell you! I have been there. I have seen it! Merlin called it "The Siege perilous,"
He has many many names. But in my reckoning he is Merlin. Ben Aaronovitch, in Doctor Who, Battlefield (6 September - 27 September 1989); the Knight Ancelyn, of the seventh incarnation of The Doctor. He appears to have been contemporary with the period of the Saxon invasion of Britain, in the latter part of the fifth century; but proably the earliest mention of his name by any writer that has come down to us is not previous to the eleventh. William Godwin, Lives of the Necromancers (1835), p. 155. You are a question that has never been posed before, Merlin. No young man, no matter how great, can know his destiny. He cannot glimpse his part in the great story that is about to unfold. Like everyone, he must live and learn. And so it shall be for the young warlock arriving at the gates of Camelot. A boy that will in time father a legend. His name... Merlin. None of us can choose our destiny, Merlin. And none of us can escape it. This is the Merlin Circle. It focuses your energy. Helps you master new spells. It is where you will learn the Art. Step inside, you leave everything else behind. Once you enter, there is no going back. The Doctor: There was a goblin, or a trickster... Or a warrior... A nameless, terrible thing, soaked in the blood of a billion galaxies. The most feared being in all the cosmos. And nothing could stop it or hold it, or reason with it. One day it would just drop out of the sky and tear down your world. Amy Pond: How did it end up in there? The Doctor: You know fairy tales. A good wizard tricked it. River Song: [to Amy] I hate good wizards in fairy tales — they always turn out to be him. Steven Moffat, referencing identification of "The Doctor" of Doctor Who as Merlin, and also as the trickster of the "fairy tale", in The Pandorica Opens [5.12] (19 June 2010). Where have you been these many years... are you just a dream Merlin? Alfred, Lord Tennyson, Idylls of the King, The Coming of Arthur. Here is an heir for Uther!" Till these and all men hail him for their king. Of letters in a tongue no man could read. And Merlin called it "The Siege perilous,"
"No man could sit but he should lose himself..."
By a sudden acquaintance with man’s rage. R. S. Thomas, in "Taliesin 1952" in Song at the Year's Turning : Poems, 1942-1954 (1955). This page was last edited on 23 October 2018, at 07:47.